Click Here for more information on the process for parishes and schools in turning in their CRS Rice Bowl donations. Every Lent, Catholics in the United States do something amazing. Their prayers, fasting and almsgiving become lifesaving aid for millions of individuals living in conditions of poverty around the world. The hungry are fed; the thirsty are given drink; the homeless find shelter. And this has been going on for more than 40 years. That’s the impact of CRS Rice Bowl. That’s how what you give up for Lent can change lives. A simple cardboard box—a CRS Rice Bowl—inspires prayers, fasting and almsgiving within Catholic families across the U.S., and delivers hope to millions around the world. 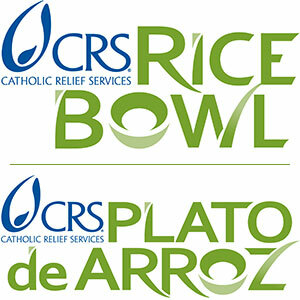 To learn more about CRS Rice Bowl and the many resources offered to parishes, schools, families and individuals, please visit CRSRiceBowl.org. On Sept. 27th, 2017, Pope Francis kicked off a two year Share the Journey campaign. To learn more about Share the Journey, visit www.sharejourney.org. Here, within the U.S., the three USCCB agencies that are coordinating efforts around Share the Journey are USCCB Office of Migration and Refugee Services, Catholic Charities USA and Catholic Relief Services. The CRS Rice Bowl program has developed several new resources that highlight Pope Francis' Share the Journey campaign. You can find those resources here. Read Archbishop Thompson's letter to all parishes and schools inviting them to participate in the CRS Rice Bowl as part of the Share the Journey Lenten Program. To learn more about 25% Rice Bowl Grants and see a list of past recipients, click on the Rice Bowl Grant tab. Lent is our time of preparation. We begin our Lenten journey on Ash Wednesday. During these 40 days, we ponder what it means to “give up, take up and lift up.” Using the spiritual practices of prayer, fasting and almsgiving, we deepen our relationship with Christ and discern where God is working in our lives.